[vc_row full_width=”” parallax_image=”” bg_type=”” parallax_style=”” bg_image_new=”” layer_image=”” bg_image_repeat=”” bg_image_size=”” bg_cstm_size=”” bg_img_attach=”” parallax_sense=”” bg_image_posiiton=”” animation_direction=”” animation_repeat=”” video_url=”” video_url_2=”” u_video_url=”” video_opts=”” video_poster=”” u_start_time=”” u_stop_time=”” viewport_vdo=”” enable_controls=”” bg_override=”” disable_on_mobile_img_parallax=”” parallax_content=”” parallax_content_sense=”” fadeout_row=”” fadeout_start_effect=”” enable_overlay=”” overlay_color=”” overlay_pattern=”” overlay_pattern_opacity=”” overlay_pattern_size=”” overlay_pattern_attachment=”” multi_color_overlay=”” multi_color_overlay_opacity=”” seperator_enable=”” seperator_type=”” seperator_position=”” seperator_shape_size=”” seperator_svg_height=”” seperator_shape_background=”” seperator_shape_border=”” seperator_shape_border_color=”” seperator_shape_border_width=”” icon_type=”” icon=”” icon_size=”” icon_color=”” icon_style=”” icon_color_bg=”” icon_border_style=”” icon_color_border=”” icon_border_size=”” icon_border_radius=”” icon_border_spacing=”” icon_img=”” img_width=”” ult_hide_row=”” ult_hide_row_large_screen=”” ult_hide_row_desktop=”” ult_hide_row_tablet=”” ult_hide_row_tablet_small=”” ult_hide_row_mobile=”” ult_hide_row_mobile_large=”” visibility=”” css_animation=”” center_row=”” typography_style=”” column_spacing=”” tablet_fullwidth_cols=”” bg_style=”” parallax=”” parallax_mobile=”” parallax_direction=”” video_bg=”” video_bg_overlay=”” border_style=””][vc_column width=”1/1″ style=”” visibility=”” css_animation=”” typo_style=”” drop_shadow=”” bg_style=”” border_style=””][vc_column_text] This ebook features 25 outstanding ways to show your appreciation to customers. You’ll notice common threads that run through each idea. Every attempt at giving thanks must be relevant and personalized, noticeable and sincere. 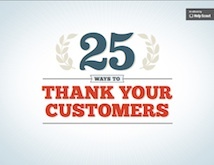 These simple requirements will ensure your show of gratitude hits home with customers.